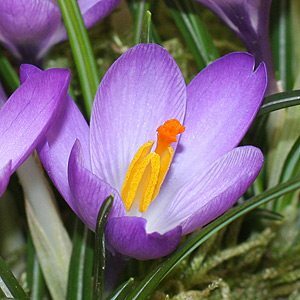 Easy to grow, Crocus vernus are available for sale in a number of varieties. They are great bulbs (corms) to naturalise into the lawn, and are equally at home in the rock garden, border or grown in containers. A spring flowering species, Crocus vernus with its large goblet shaped is commonly called the ‘Giant Crocus’. The subject of much hybridization, this is a an early flowering species with many desirable characteristics. Originally from areas with cold winters, from the Ukraine through to the mountains of northern Italy, it is the cultivars we see offered rather than the true species. In nature the species is variable with flowers from white to purple, and a few striped varieties that have been used for hybridization. Upright, with open flowers, this is a species that modern horticulture owes a debt. Crocus vernus ‘Grande Maitre’ – Deep violet blue flowers. Crocus vernus ‘Jeanne d’arc’ – A white flowering variety. Crocus vernus ‘Pickwick’ – Outstanding variety. Crocus vernus ‘Vanguard – Very interesting silvery violet blue flowers. Crocus vernus ‘Flower record’ – Very deep purple flowers with large cup shaped blooms. Like many crocus, a cool winter is essential for good flowering. In warmer climates bulbs will need to be lifted in summer once they go dormant and then given two months in the refrigerator (try the crisper). Lift them in summer and chill them through autumn before replanting mid winter. These are an easy care bulb once established. Plant and water in well with a liquid seaweed fertiliser. You will need to divide larger clumps every 5 years or so. Best carried out in summer while they are dormant. In containers you will need to repot every two years to maintain vigour. If you have naturalised into the lawn, avoid mowing until the foliage has died back, this allows the bulb to store energy for the next seasons flowering. Height – To 15cm when in flower. Flower colour – Varied, white to purple, with striped varieties also available. Foliage – Green and grass like. They need to planted out around mid winter in warmer climates after they have been chilled. Fertilize with a liquid seaweed fertilizer when planting and again after flowering.